About a month ago, I presented a comparison of estimates for the nation’s public-sector pension problem. While none of the results were encouraging, there was huge variation in the degree of frightfulness — the difference mainly being in the way in which they calculate liabilities. 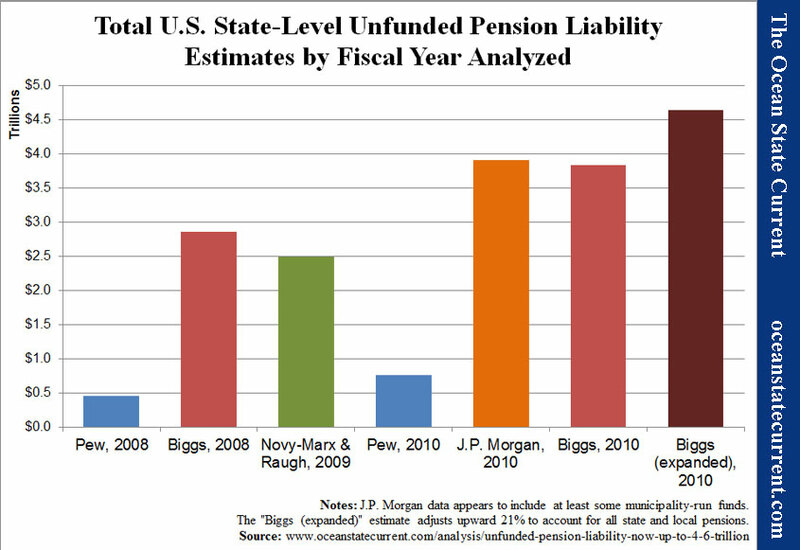 For the larger column, Biggs “grossed” his results for known pension data upwards to account for an estimate of state and local pensions not included. His initial, un-expanded calculation is similar to the J.P. Morgan finding that was recently leaked to financial reporter Charlie Gasparino. For the most part, the essential difference between the various estimates comes down to the percentage chosen for the discount rate — the annual downward adjustment of a future payment to figure out its value today. Indeed, the difference comes down almost to how a discount rate should be defined. Following the Governmental Accounting Standards Board (GASB), public sector pension managers come up with the unfunded liabilities shown in the Pew results in the chart by equating discount rates and investment returns. In other words, they assume that they’ll get, say, 7.5% return on their investment (including inflation) every year, and they adjust their future obligations down to a “present value” based on that assumption. If they hit their estimate every year, they’ll have everything they need in the future. Biggs and the others argue that discount rates should take into account the risk that the investments won’t perform as expected, as is common practice in the private sector. A guaranteed investment is more valuable than one that is risky. Not long ago, I was flipping through the channels and came across an old episode of Deal or No Deal, and it provided an excellent illustration. The woman playing the game was down to two closed briefcases. One had $1 million in it; the other had $400. She was offered the choice of taking around $423,000 to end the game right there. Put differently, she was offered the trade of a high-risk, high-payoff investment for a zero-risk, lower-payoff investment. Straight odds would suggest that her chance was 50:50, but the actual value of the million-dollar case — at a distance of a single roll of the dice — was to her even less than that would suggest. And she was wise to make the deal, because as it happened, she would have ended up with the $400! In a similar way, many economists suggest that the pension fund discount rate should be the same as for “risk free” investments, like Treasury bonds, because laws and constitutions require that the obligations be paid. In a sense, public-sector employees (like those whose unions are suing the state over its 2011 pension reform) are insisting that Deal or No Deal ought to make up the difference when the 50% chance of $1 million turns out to be 100% chance of a few hundred. The speed at which this topic becomes mind-bogglingly complex is as good an indication as any that the premise of defined-benefit pensions was flawed from the beginning. From the public’s point of view, the value of an employee’s labor is his salary plus his benefits, including the amount that is projected to be paid every year for retirement. For decades, public officials have presented that value as if there was no risk that the investment market wouldn’t carry its weight in the bargain. It is as if the live game show audience is being told, as the clock runs down, that they’re liable for the cost of the top prize. As these estimates of unfunded liabilities continue to climb, we can expect to hear more and more proposals to buy out retirees and not-yet-retired public employees. It would be worth quite a bit of bonded debt for a city or state to get rid of the risk associated with its post-employment benefits. The question then becomes how much unions and retirees really believe in the sanctity of their contracts. In Central Falls, the majority of retirees gave up their claims to 100% of their promised pensions for a guarantee of roughly half and a good shot at 75%. As the problems continue to mount and to expand across the state and nation, the value of cash in-hand is sure to increase relative to ephemeral promises that simply can’t be kept.